N is for Nook Color! My husband came through and got me a Nook for my birthday. So sweet! 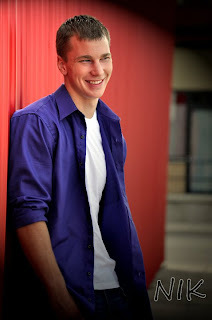 I think it's because I'm having such a hard time with moving our son to college and adjusting to this empty nest thing. In fact, this is the very first night I made dinner for the two of us. It is so strange. He came in one night and asked if I was going to cook. I looked at him funny. I think he went and made a peanut butter sandwich. No Nik, no dinner. Sorry. I was in mourning. I did make baked chicken and potatoes tonight. Anyway, I will sing the praises of the Nook color. It is pretty awesome. I have The Help downloaded on it, which Mari and I saw at the movies and it was AWESOME! Everyone should go see it. I also went to my public library and signed up to borrow e-books through them. That is the reason I went with the Nook in the first place. As soon as I was told it's the kind libraries are using, I was sold! Anyone shopping for one need to know this. I'm all into using libraries. I also have access to Pandora radio and anything on the web, really. The only thing is, it isn't 3G but that's okay. I can also set up my email accounts. For all of us that have faithwriter emails though - that won't work. I'm thinking I need to move them over to gmail soon. Maybe. Maybe not. The full New International Version (NIV), New International Reader's Version (NIrV), Today's New International Version (TNIV), The Message, or the King James Version (KJV) downloaded to your device, so no Internet connection required! Great looking text—most handheld Bibles look terrible, but the NIV Bible is formatted to look like your printed bible. Easily take notes—keep them on your device or email them to yourself or friends! Bookmark favorite passages and quickly return to them. Navigable history of where you've been recently, like in a web browser. Anyway, I just wanted to quick check in and say - N is for Nook color and it's also for Nik, who I'm missing lots. Especially when I have to go upstairs and feed the turtles :( Go check out other N posts at Patty's blog! Second day of school done and third one will soon be here. Thank you for the prayers and encouragement. Until O.... or before! 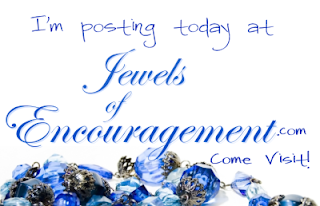 Come help me celebrate my birthday by following me over to the Jewels of Encouragement blog! I may not be a spring chicken but I certainly don't have one foot in the grave! As always, I get quite personal but that is my life as of now. Soppy wet and full of changes. See you at Joe and we'll talk more there! I am very late this week. I just got home yesterday from Michigan, which does begin with M too, I know. But this post is my focus now - Moving On. We are moving my son Nik to college tomorrow, to Southern Illinois University of Edwardsville. He's planning to go into Criminal Justice. I know he'll do well. He's a very smart guy. I know he'll make lots of friends plus lots of his friends from Clinton will be there too. That's not the problem either. The problem isn't him...the problem is me. He's my baby. I had him eighteen years ago. I was thirty years old. Ryan was about ten when Nik was born and Kristen was eight. That's a pretty big age span. By then I had things pretty much figured out. I wasn't so scared. We had more fun. Nik went everywhere and did everything. He learned to count by keeping score at Ryan's baseball games. He was really good at it too. The older boys played with Nik so he was really sociable and it's been the same to this day. He's my fun kid. Not ever shy. Never. He has a dry sense of humor and he's so very funny. I got to work at the same school as Nik for these four years. It's been so much fun and now....guess what? No job openings for teacher's aides at SIUE:) Don't think the two hour commute is feasible even if there were. I think Nik might frown on the idea too. He loves me but he would draw the line to me following him to college. He's ready. His bags are packed. I know because I helped him tonight. He's been ready for a year. I know because I've heard him bemoaning the fact that his senior year took so very long. Yes, he's ready but this Mama Heart isn't. This Mama Heart is breaking in half. M is for moving on, which is what Nik is supposed to do but it sure does hurt. It hurts bad. But I also know that I'll get used to it soon, too soon. And he'll be home soon, too soon:) Just when we get used to our empty house. :) But for now, my heart breaks and the tears flow. Tomorrow is going to be a killer on this mama and so many other mama's in Edwardsville and all over the country. M is for moving on...and other M posts that posted much earlier than I did at Peej's Ordinary Lives. Sorry for the tears. This is a special teen book review edition brought to you by Waterbrook/Multnomah publishers. Sierra Jensen, written by Robin Jones Gunn, is wonderful, as well-written teen books often are. I read the E-book version, which included all four books in one. It seems I came in the middle of the lives of these characters but it didn't matter. I didn't get lost at all. It is a good stand alone series but, if you're interested, you might want to read the Christy Miller series first. It introduces all of these characters. You will fall in love with them, for sure. I did, and I'm a forty-something mom. The book begins with high school junior age, Sierra on a mission trip. She makes life-long friends with these college-age kids that she works with. She struggles with many insecurities being the youngest. She also is scared to be going back home because while she is gone, her family has relocated. They have moved in with her grandmother. She will be having to make all new friends in a new school. It's all very scary. This young girl has all the insecurities and joys and sorrows of any young Christian teenager and she messes up and she gets into trouble. It is a fun read. Once you have begun to read the books, you certainly do not want to stop. I highly recommend this series for your teenage girl, ages junior high on up. I enjoyed it. I'm not too proud to admit that! Go visit Christianbook.com or Amazon.com. For the letter L, it occurred to me that I’ve been talking about all the crying I've been doing. I wonder how full my bottle is that God has stored for me. He’s probably switched over to the super-sized one by now. I imagined standing beside Mary looking up at Jesus, my arm around her shoulder, maybe helping her stand as she wailed in anguish. No, we’ll never understand that moment in time. We weren’t there. We didn’t experience it first-hand, and yet we get to reap the reward of Christ’s death on the cross. When we sat, and the cracker and juice was passed, I kept my eyes opened and twisted and turned that small piece of cracker in my hand and wept. My Jesus suffered for me. For my family. For you. Last Sunday, Laury wept. I don’t know if Nik noticed. I’m sure he’s probably thankful he’s off to college soon. Thinking of that makes me weep even more. He’s off to make his own way in the world. He won’t have me waking him up for church. I don’t know if he’ll go anywhere. That causes me great heartache. “Jesus wept.” John 11:35 is shortest verse in the whole Bible and yet the verse that holds the most meaning to me in my life right now. Jesus wept for a friend, Lazarus, who had just died. So much is going on right now in this world. But not only in the world but in our lives and in the lives of our friends and family. It's hard to hold it all in our hearts. It comes out in tears for women. At least it does for me. I have to learn to hand it all over to my God who is our burden carrier. He makes our load so much lighter. Maybe that's what you're supposed to do, too. We all know this but we need to be reminded often. If you ever give me a prayer request or casually tell me something that is bothering you, know I'm probably on the other end of the computer weeping because that's what I do right now. I weep. It's how I handle things at this moment in my life. And if you see me in person, be ready with the tissues. It's how I roll at my nearly 48 years of age. Jesus wept so I can follow in His footsteps. Go to Patty's blog for more L posts. See you there! Here's the song that affected me so. Hope you'll take some time to worship our Lord and Savior, Jesus. I'm writing about my directionally challenged drive to pick up my friend on Wednesday before we go to the Faithwriter conference on Thursday. Please pop over there to see my funny story and my prayer request. Tomorrow is A2Z day with the Letter L. I have a post in mind that you will not want to miss! See you then! Well now...I've been keeping up with the a2z posts! Amazing! I thought I'd do a run-down. Ready? Awesome, Blessing, Changes, Declaration, Expression, Friend, Gyno, Hands, I as in Me, and Jesus. Doesn't seem like so much listed out. It does show the many directions my mind goes, though, for sure. As I was pondering K, the only thing that kept popping up was kelp of all things. Kelp? Why kelp? So...I thought I would go for it. Why not? Actually, I thought kelp was a fish. Ha! So not. Kelp is algae that grows in the ocean in underwater forests. So anyway, there you go. That is kelp. Last night I went with my husband to visit a friend who just had surgery. Actually, he was still in surgery so we met with his family who was waiting, none too patiently. I wouldn't know about that. I'm the one who is always in surgery. Afterwards, we walked around Best Buy and Walmart and I checked out the Kindles, planting appropriate seeds as we went along. I'm pretty sure my husband got the hint that I want one. He said my birthday is coming up. So maybe... :) The problem is, do I really? What is the draw? I've been reading Ebooks on my computer now. Waterbrook has gone to electronic books for their reviewers. I was irritated at first but now it's kind of fun and different. I'm all into changes. That's just me. Oh, that was my C word, after all. :) and there are lots of books that can be downloaded free from Christianbooks.com and Amazon. FREE! Did you hear that? Jim and I stood over the counter trying to avoid the glare, to figure out the differences between the two Kindles. 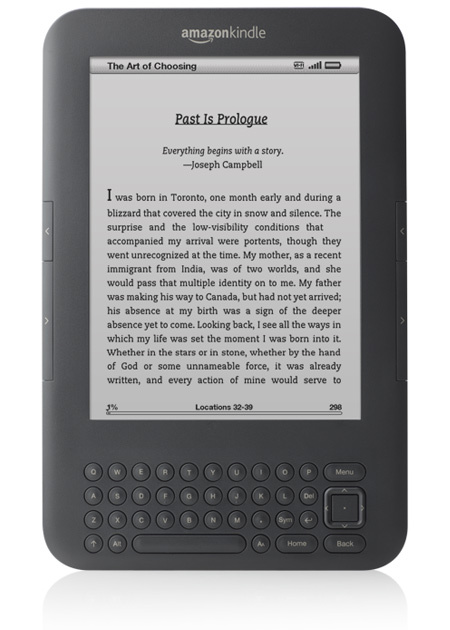 There is the Kindle for $114 and then the Kindle for $139. Now I see online that the Nook has one for $114 also. Now come on. How am I supposed to choose? But with Barnes and Noble out of the picture, that makes it kind of scary. I saw cheaper Ereaders but I don't think I would choose one of those. It's not bad reading these books on my computer, except I can't read, like...in my car when my husband's in the hardware store. I also can't pull it out for a quick peek at the doctor's office. :( No, a Kindle would be much nicer. I've been finding myself falling asleep at night with the computer on my lap, too, while reading. Falling asleep with a 'book' in your lap, when the 'book' is your computer, is sooo not a good thing! Anyway, K is for lots more things than kelp and Kindle, I'm pretty sure. I just couldn't think of anything else. I peeked at other people's posts and they wrote about kitties and kooky and krazy and kickstands. Theirs might be a whole lot more interesting than mine! I would appreciate input, though. I'll only get this one chance, if I get the chance at all. So I have to choose right. I feel like a little kid in a candy store. "Ooooo! Ahhhhhh!" 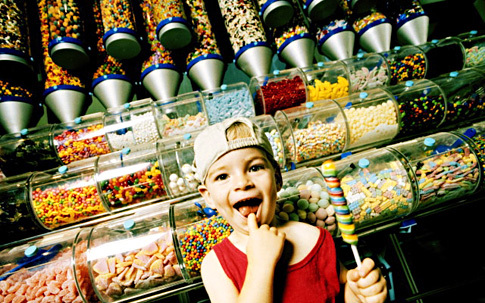 Can you see me on my tippie toes looking over the counter trying to decide what I want?